Being inspired I decided to venture out into the garden, and eventually the greenhouse. Soon after entering, I look down to a disturbed area behind our aquaponics tanks, to behold a wondrous site. 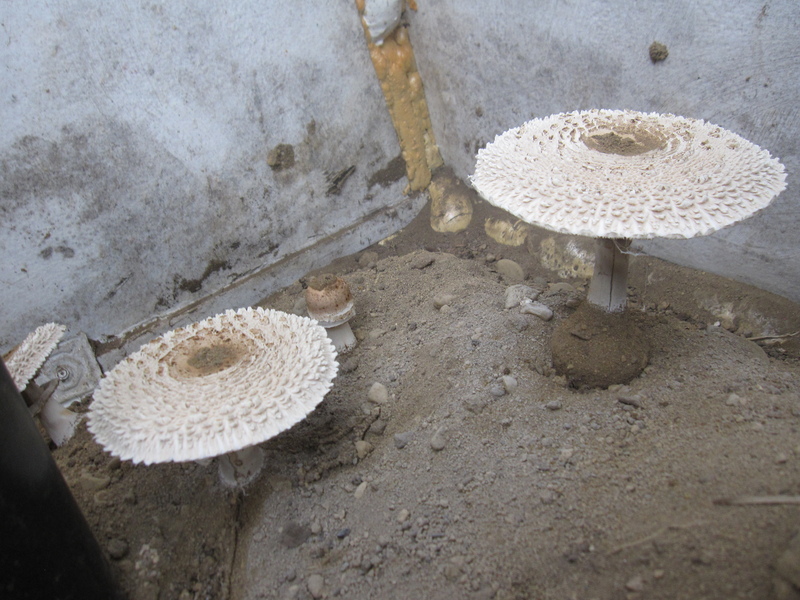 A patch of elegant parasol mushrooms (Macrolepiota procera) had exploded through the sand. In the picture above you can actually see a white film covering the ground, as the mushrooms had ejected their reproductive white spores (one way to tell these from their green spored poisonous lookalike cousins). With a hunch from past mushroom forays, I decided to key out the mushroom. My hunch was confirmed, the parasol is a delicious wild edible. I did not encourage them, or even expect them inside the greenhouse on a sand pile, but there it was shinning brightly for all to see, calling out, asking me to pick it. An intelligent evolutionary adaptation, for spreading its spores around my garden as I walk to the kitchen to cook it for dinner.